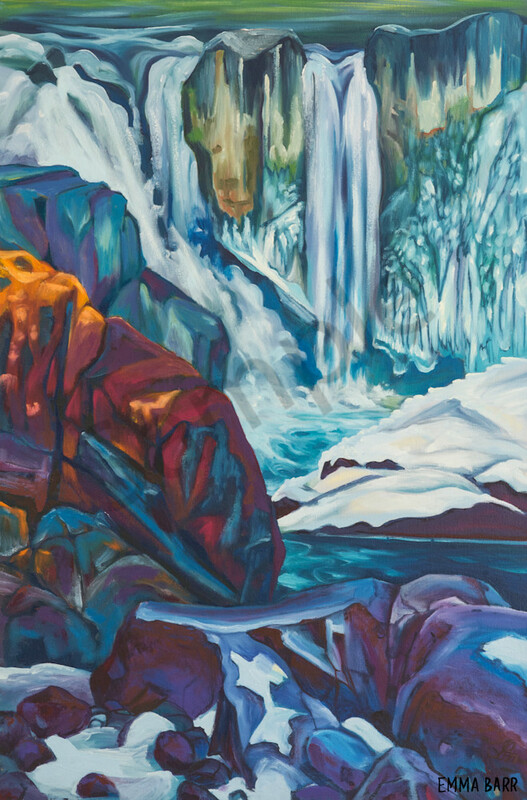 "Be Still and Listen" is a close-up of the same falls featured in "Cedar Flanked Falls." I liked zooming in because it emphasized what was happening with the features ad shoreline that you couldn't see from up high. I sat very still and listened to the amazing fluctuating sounds of the falls crashing into the rest of the water. Closer to the rocks I could now see the patterns and shapes in the rock and ice in even more detail. Cheakamus River is a beautiful, crashing, turquoise-coloured river that flows from Cheakamus Lake, through the Cheakamus Valley to Daisy Lake. Also a popular kayaking route, the main attraction to Cheakamus River is the wonderful and quite extensive network of hiking and biking trails that run along either side of it. When I came across this February scene of moving and frozen water encased in a cavern of cliffs lined with bright green cedars, I could not resist!